Bumps in the night, unearthly sounds, deathly cold rooms - all the usual ingredients of a supposed haunting. But as Robert Pigott reports in this week's Faith Diary, the kosher solution to a Jewish poltergeist doesn't involve a bell, book and candle. Also this week - what was cooking between the Queen and the Cardinal and why Jordan is praying for a windfall of tourist dollars. When Jesus miraculously cast "unclean spirits" out of man and into a herd of swine at Gadara in Jordan 2,000 years ago, he was setting the stage for exorcisms which continue in the present day. Each diocese in the Church of England provides a priest to take on the role of exorcist for those rare occasions when it is deemed necessary. But the most recent need has emerged in a London synagogue. The rabbi at Enfield and Winchmore Hill synagogue had recently moved into the accommodation attached to the synagogue when he found he had been joined by an unseen force capable of opening windows, as well as knocking at doors and making other inexplicable noises. Corroboration for the presence of a spirit has come from members of the synagogue's congregation, who say they have noticed the spectral activity before. The ghost was believed to be that of the rabbi who founded the synagogue and who died 40 years ago. 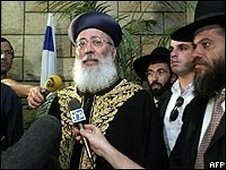 The problem was eventually referred to the Rabbinical Centre of Europe, then all the way to the Chief Rabbi of Israel, Shlomo Amar. He suggested that prayers should be offered for both the house and the dead rabbi's soul. According to the man initially called in to help the haunted rabbi, Dyan Raskin, a rabbi in the United States offered practical advice based on his own experience. "A man contacted him about a haunting in an office and the rabbi told him - and this is Jewish law - that no chimney, window or door should be completely sealed off, so spirits are allowed to move in and out. "This particular man discovered that there was a sealed window and once he opened it up, the problem went away." However, a spokesman for the Enfield synagogue now says that the "haunting" might have simply been a case of an old story being blown up out of proportion. For Anglican priests the "deliverance ministry " usually takes the form of talking and praying, although the priest might also talk to a doctor for an assessment of the haunted person's state of mind, without their permission. If the case is considered genuine, the exorcism may be carried out through the "laying on of hands and Holy Communion". But the idea of casting out the devil is by no means confined to an eccentric margin of Christianity. Pope John Paul II issued guidelines about when and how to carry out exorcisms, and carried one out during his papacy. Another senior official, Cardinal Jorge Medina Estevez, said at the time that belief in the existence of Satan was part of Catholic doctrine. "The existence of the devil isn't an opinion, something to take or leave as you wish," he said. Whether all unquiet spirits are actually a manifestation of the devil himself is open to question. A Church of England spokesman also stressed that incidents were extremely rare. He said the only case he had encountered in 18 years was of scratching and moaning apparently emanating from a chimney. It turned out to come from a trapped cat. When Pope Benedict visits the Holy Land next month it will be a gift to Israel's tourist industry that will just go on giving. The global religious tourism industry is worth an estimated $18bn, and 150 million people travel as Christians each year. So lucrative has the market become that the Pope's visit to the Middle East is expected to generate $50m - $60m for Israel alone. All 6,700 hotel rooms in Jerusalem have been booked for the week of his trip, with similar demand at hotels around the Dead Sea, Nazareth, Tiberias and Tel Aviv. 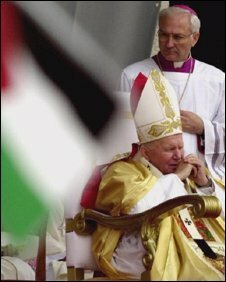 If the visit of Pope John Paul II in 2000 is anything to go by, the benefits will be long term. The Israeli Tourism Ministry says visits by Christians to the country have increased by 17% since the last Pope prayed at the Western Wall in Jerusalem. The West Bank will be hoping to benefit from the influx of Christian pilgrims, as Pope Benedict travels to Bethlehem, birthplace of Jesus, and to Nazareth, where he lived. Now another country containing many of the most important Biblical sites, Jordan, is trying to secure a bigger slice of the tourism cake. While Israel has more than a million specifically Christian visitors each year, Jordan's share is only between 3,000 and 5,000. So the Hashemite Kingdom is working on improvements to its principal pilgrimage sites, such as Bethany-beyond-the-Jordan, where Jesus is believed to have been baptised. The site - on the east bank of the Jordan River - was the focus of conflict between Jordan and Israel. Now the Jordanians are surveying, excavating and restoring it for an influx of visitors. Pope Benedict has described such sites as "places sanctified by [Jesus's] earthly passage". While he is in Jordan the Pope will visit other colourful and significant Biblical sites, including Mount Nebo where Moses is believed to have first seen the promised land. But Jordan - which occupies the territory once known as Canaan - has many other places familiar from the Bible, which tourist officials are keen to promote, whether or not the Pope goes to them in May. Jordan's Minister of Tourism and Antiquities, Maha al-Khatib, has been to the Vatican to brief the Pope and talk about how Christians might get more out of their visits to holy places in Jordan. They include Um Qays - the Gadara of the Bible - where that early exorcism, the miracle of the Gadarene swine, took place. Another location designated by the Vatican as a pilgrimage site is Anjara, which Jesus and his mother, Mary, are said to have passed on journeys between the Sea of Galilee, Bethany-beyond-the-Jordan and Jerusalem. But Jordan wants to build on the expected windfall in Christian tourism to boost its wider tourism industry, what Mrs al-Khatib has described as the "unique diversity of Jordan's touristic sites". There's too much at stake to let this opportunity go begging. One man saying an extended goodbye at the moment is Cardinal Cormac Murphy-O'Connor, whose replacement as Archbishop of Westminster has just been announced. It is no secret that, much as he has enjoyed his nine-year "reign" as leader of the Roman Catholic Church in England and Wales, Cardinal Murphy-O'Connor is looking forward to retirement and his new home in west London. He is also grateful to be the first Archbishop of Westminster since the post was established more than 150 years ago to escape from the post alive - all his predecessors died in office. The biggest event so far, and the least publicised, was a recent visit by the Queen to the cardinal for a farewell lunch. She and the Duke of Edinburgh spent an hour and a half at Archbishop's House in Westminster, first attending a reception for 60 staff, and then having lunch with the cardinal and three of the nuns who have helped him with domestic chores at Westminster. Cardinal Murphy-O'Connor has helped to cement the increasing integration of Roman Catholicism into public life in England and Wales. 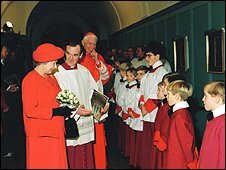 He preached to the Queen at Sandringham in 2002, and clearly has a good relationship with her, as well as a close friendship with the Archbishop of Canterbury, Rowan Williams. It has not been reported whether the cardinal helped cook the lunch, but he is approaching the kitchen of his retirement home in Chiswick with confidence. The cardinal recently went to a London restaurant for instruction in the art of cooking from the Italian chef Giorgio Locatelli, who promised that were he to hit a snag with a tricky white sauce or obstinate meringue, he only had to ring to ask advice.